GO TO COURSE FINDER TO START EDUCERE'S 4-STEP ONLINE REGISTRATION PROCESS. SIMPLY CLICK "ADD TO CART" ON ANY COURSE OVERVIEW PAGE. 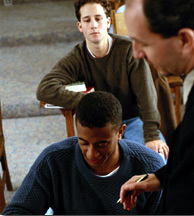 Students and educators are required to have the necessary computer access, capabilities, and competency to apply for a program. If a program has prerequisite requirements it will be noted on the program overview page. All registrations must be submitted thorugh Educere's 4-step online registration process or to Educere, LLC, Application Department, 455 Pennsylvania Avenue, Suite 140, Fort Washington PA, 19034, Fax- 866-348-1050 by the registration due date. The Educere Application, including registrant, and in the case of students, parent/guardian signature, and the Institution Registration, including registrant agreement and/or signature, is always required. In the case for students, some participating education providers also require that a Student Release be signed by the student's parent/guardian. Educere coordinates the processing of the registration and release forms at the negotiated fees Educere has secured with each participating education provider. Program offerings are subject to change without notice and Educere does not guarantee that a program from any participating education provider will be available to a student. Enrollment in the program is contingent on acceptance from the participating education provider delivering the program. The cost of a program will vary from program to program. The program fee is payable to Educere, LLC and must be paid in full prior to the enrollment of a student in any program. The program fee reflects the cost to enroll in the program and access to Educere's Personal Learning Coach services only. Educere accepts credit cards (Visa, Mastercard, or Discover), check or money orders. Federal Higher Education Student Assistance programs are not available and cannot be accepted for programs offered through Educere. Educere coordinates the processing of the registration forms at the negotiated fees Educere has secured with each participating education provider. Program fees will be returned if a program is not available or if the participating education provider delivering the program does not accept the program registration. Program materials are an additional cost unless otherwise noted on the program overview page. Generally, the cost of program materials range from $25 to $150. Other fees could include a nominal fee to the participating education provider for transcripts. For schools covering the cost of the program fee and program materials for the registrant, Educere typically coordinates the purchase and delivery of program materials to the registrant. In instances where the cost of the program is paid by the registrant, it is the responsibility of the registrant to order and pay for the program materials. To assist the registrant in this process, Educere provides a link to the bookstore of the participating education provider delivering the program on the program overview page. However, registrants may order the program materials from any vendor of the registrant's choice. If ordering program materials from another vendor registrants should make certain to obtain the correct titles and editions. The email address and toll-free number to access an Educere Personal Learning Coach is included in the registration section of each program overview page should the student and/or educator need help registering for a program.